King Henry the Fowler has arrived in Brabant where he has assembled the German tribes in order to expel the Hungarians from his dominions.Count Friedrich von Telramund, has accused the Duke's sister, Elsa, of murdering her brother. He calls upon the King to punish Elsa and to make him, Telramund, the new Duke of Brabant. The King calls for Elsa to answer Telramund's accusation. Elsa herself makes the call. A boat drawn by a swan appears on the river and in it stands a knight in shining armour. He disembarks, dismisses the swan, respectfully greets the king, and asks Elsa if she will have him as her champion. Elsa kneels in front of him and places her honour in his keeping. He asks but one thing in return for his service: she is never to ask him his name or where he has come from. Elsa agrees to this. As Elsa and her attendants are about to enter the church, Ortrud appears, clad in magnificent attire, and challenges Elsa to tell who her husband is, and to explain why anyone should follow him. After that, King Henry enters with the Knight. Elsa tells both of them that Ortrud was interrupting the ceremony. 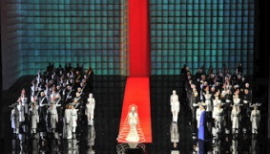 Elsa and her new husband are ushered in with the well-known bridal chorus, and the couple express their love for each other. Ortrud's words, however, are impressed upon Elsa, and, despite his warning, she asks her husband the fatal question. Before the Knight can answer, Telramund and his four recruits rush into the room in order to attack him. The knight defeats and kills Telramund. Then, he sorrowfully turns to Elsa and asks her to follow him to the king, to whom he will now reveal the mystery. The troops arrive equipped for war. Telramund's corpse is brought in, Elsa comes forward, then the Knight. He discloses his identity to the king and Elsa. 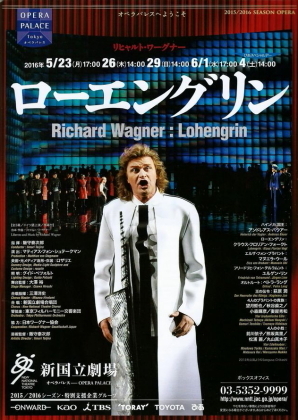 He tells the story of the Holy Grail, on the Monsalvat, and reveals himself as Lohengrin, Knight of the Holy Grail and son of King Parsifal. The time for his return has arrived and he has only tarried to prove Elsa innocent. As he sadly bids farewell to his beloved bride, the swan reappears. Lohengrin prays that Elsa may recover her lost brother, and gives her his sword, horn and ring; which allows Elsa to remember him fully. 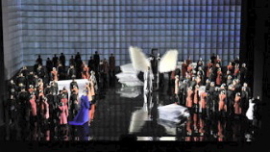 Then, when Lohengrin tries to get in the boat, Ortrud appears. She tells Elsa that the swan who drove Lohengrin to the bank was actually Gottfried, Elsa's brother; and she put a curse on him by turning him into a swan. The people considered Ortrud guilty of witchcraft. 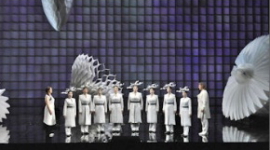 Lohengrin prays to the swan, and the swan turns into another form, a young Gottfried. He elects him as the Duke of Brabant. Ortrud sinks as she sees him.